Reminiscent of a home you might expect to find nestled in the Hollywood Hills, ‘Villa Biscaya’ is an authentic Spanish Mission style residence secluded in one of Rose Bay’s most exclusive harbourside enclaves, moments from the waterfront and village. Set amid beautifully landscaped gardens on a vast 1,126 square metre parcel of land, complete with a poolside cabana, this landmark property was awarded a Woollahra Conservation Award in 2001. Built in 1929 sparing no expense, ‘Villa Biscaya’ was designed by architect Alan Edgecliff Stafford. Extensively and meticulously rebuilt in 2001 and refurbished in 2012 the home has been reinvented for luxurious contemporary living, offering a multitude of entertaining spaces and wonderful alfresco areas. 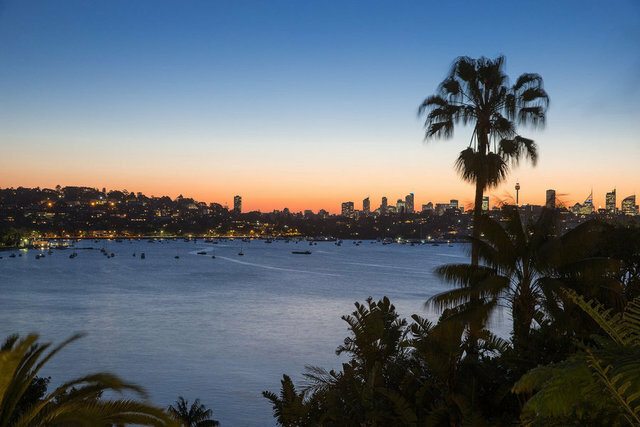 From its exceptionally private, elevated vantage point, the two-story residence commands a sweeping panorama across the full arc of Rose Bay, from the leafy slopes of Bellevue Hill and Point Piper to the majestic cityscape. The lounge room is exceptionally grand and warmed by the original wood-burning fireplace, while the formal dining room comfortably accommodates 14 diners. Opening to its own private terrace area, the more casual family area includes a beautiful island gas kitchen that features bespoke joinery and Calcutta marble. Three ensuite bedrooms, one with an adjoining study/nursery/living room, a total of 4.5 stylish bathrooms, plus an elegant office or fourth bedroom. The height of opulence, the expansive master wing is complete with his ‘n’ hers dressing rooms, a marble ensuite, a relaxed sitting room and a loggia where you can soak up the view. Privately hidden within the grounds, a magnificent self-contained cabana/bedroom 5 makes a wonderful guest or teenagers’ retreat. Featuring a fully integrated kitchen, a stone bathroom, stone flooring, and bi-folding doors, the cabana opens to a shady terrace by the pool. The elegant residence showcases all of the impressive hallmarks of the inter-war Spanish Mission style, including elaborate arched timber doorways, tiled courtyards, exposed ceiling beams, wrought-iron balconies and Huon pine floorboards. The impressive entrance foyer is finished with classic granite tiles, while the Cabana and all bathrooms are under floor heated. A host of contemporary prestige features have been added, including a custom-designed 1000+ bottle wine cellar, gas heating, reverse cycle air-conditioning and a back-to-base security system. Along with a large garage there is dual driveway parking plus a versatile studio and storeroom below. There is a current approved DA for property enhancement and expansion. Wide shady verandas extend from both levels of the cascading gardens. Encompassing a variety of entertaining terraces they feature integrated ‘daybed’ seating, two dedicated barbecue areas. The parkland-like grounds are punctuated by expanses of level lawn, soothing water features and perfectly sculpted hedges. Meander down to the beautiful swimming pool adjacent to the cabana, and unwind in a private tropical sanctuary framed by established palm trees.